Vinyl Digital Exclusive on Black Vinyl! Brand new exclusive Cover-Artwork. 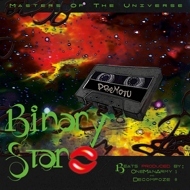 "Masters of the Universe" is the 2000 Hip Hop Classic from the American duo Binary Star (One Be Lo, Senim, OneManArmy, Decompoze)!